What Types of Dangers Does Chlorine Pose? Chlorine is one of the most commonly used chemical agents in the world. In addition to being utilized for spa and swimming pool maintenance, this substance is an ingredient in many household cleaners and is a strong bleaching agent. As with most powerful chemicals, there are risks associated with chlorine usage. As with all household chemicals, it is necessary to store spa chlorine out of reach of children, as consumption could be fatal. Additionally chlorine must be stored away from any substances with which it could react. For example, there is a risk of combustion if chlorine mixes with any type of acid, brake fluid, gasoline, kerosene, motor oil or other flammable substances. The smell created when chlorine reacts with organic matter in the water can sting your eyes, and breathing in chlorine fumes can irritate your respiratory system. It is believed that chlorine fumes may trigger asthma symptoms in children. Because chlorine is a bleaching agent, it can have a bleaching effect on hair, swimsuits and other materials with which it comes into contact. Keeping pH in balance is of utmost importance in water treated with chlorine. If the pH levels aren't where they need to be, the chemical isn't able to effectively clean bacteria. This means that bacteria can still be present even in water that has been treated with chlorine. It's important to keep in mind the pH levels change as chlorine levels change, so keeping the levels adjusted is an ongoing process. The ideal ranges include a pH level ranging from 7.2 - 7.6 parts per million (ppm) and a free chlorine level of three to five ppm. Perhaps the most significant of the dangers of chlorine in spas relates to the association between the chemical and cancer. Some studies indicate that there is an association between absorption of chlorine through the skin and certain kinds of cancers. Because the water in spas is maintained at such high temperatures, it is believed that there is an increased likelihood of chlorine absorption through the pores in this type of environment. There are alternatives for those concerned about the dangers of chlorine in spas. Bromine: Some people choose bromine as an alternative to chlorine. Even though bromine is still a chemical additive, it does not have the same harsh smell as chlorine and is easier to use. However, this substnace is not without risk. BaquaSpa Water Care System: This system is free from both chlorine and bromine. The system is an effective protection against harmful bacteria and microorganisms without the harsh chlorine smell or other potentially harmful effects. BaquaSpa has a reputation for being gentle to skin and eyes. The active microbial ingredient in this product is polyhexamethylene biguanide.It is more stable in the hot water of a spa environment than other cleansing systems, which means it stays active in the water for an extended period of time. It cannot safely be mixed with bromine or chlorine. Spa Ionizers: Ionizers designed specifically for spa systems can be a good alternative for those who want to reduce the use of chemicals in their spas. The process of ionization works by releasing copper and silver ions into the water, which effectively kill both bacteria and algae. If you use an ionizer, you will have to use either a chlorine or non-chlorine oxidizing agent from time to time to clarify the water and maintain optimum spa balance. If you use a non-chlorine oxidizer with your ionizer, your hot tub will be chemical-free. Natural alternatives: All natural spa maintenance systems such as Natural Hot Tub and Spa can keep your spa water clear and free from bacteria with natural enzymes rather than chemical ingredients. If you switch to an all-natural system from using chemicals, it's important to use a spa cleanser first, to rid your system of chemical residues. There is debate as to whether natural all-alternatives are as effective at eliminating bacteria and microbial agents as other water maintenance methods. 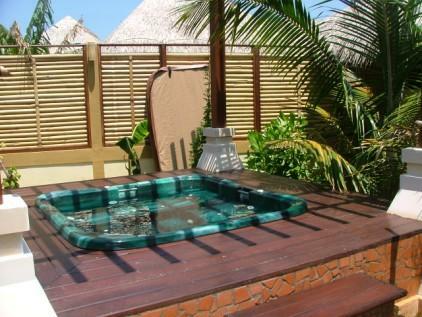 Keeping the water in your spa free from harmful bacteria is a must. However, you don't have to use chlorine to do so. If you are concerned about the dangers of chlorine in spas, you can select a different technique for keeping the water in your hot tub clean. No matter what method you use to keep your spa clean and free from bacteria, there are risks associated with improper usage. It's vital for you to follow manufacturer instructions for using and storing all spa maintenance products, chlorine-based or not, in order to avoid unnecessary risks to health and safety.